Hope Whispers: Now Reading: A little bit of everything! Now Reading: A little bit of everything! Somehow I went from a one book at a time kinda girl to a read everything at once girl. And as crazy as its making me, I love it. Although I will admit when I picked up one of the books on Sunday, I read the whole thing. Good thing I got the next book in the series. Absolutely, positively by Heather Webber. This is my new in between Stephanie Plum series. I want to say I found this series under the Chic Lit section of Good Reads. But I may have literally looked up series similar to the Plum Series to get my next fix. And it worked. I blew through the first two book and am trying to slow it down, because the library only has up to the third book. The Proper Care and Feeding of Marriage by Dr. Laura Schlessinger. I'm still working on this one. I got a little behind on my library books last week so I had to finish them up first. I actually did read though this one but am going back to a few things and re reading them. I have gotten a handful of comments on how our marriage works and when I tell people, they usually go in to the whole "this is the 2000's and women need to step up for themselves" speech. And I don't think that is wrong by any means. But I do believe that every marriage is different and no one book can tell us what will or will not work for all of us. 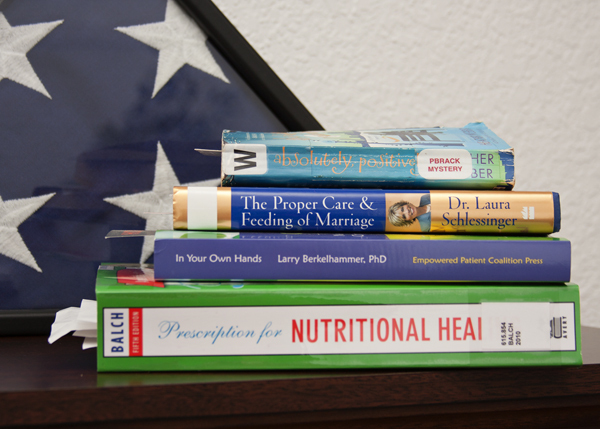 In Your Own Hands by Larry Berkelhammer, PhD. This book was sent to me to read and review. There will be a giveaway as soon as I get though it too. Last year Larry was a guest here and shared this great post Hope Heals. I get a lot of people who ask how I do it. How I take all the stress and worries and just keep on going. His post hit the jackpot. Because I choose to. I cant wait get though the book. My highlighter is ready. One of the plus sides of owning a book over checking one out. Last but not least by any means, Prescription for Nutritional Health. I saw this book on the shelf when I went to pick up some other books I had on hold at the library. And as you can see from all the papers sticking out of it, I've already gone though and saved a few chapters I need to read. Insomnia, Cirrhosis, Fatigue are just a few. After a short summary of each condition there is a list of nutrients and supplements that will help. And then recommendations as well as how to treat and help each one. So much information. I love it. So there you have it. What have you read lately? I wasn't always a reader but I am so glad that I am now! Oh my gosh looks like my nightstand! I do the exact same thing - I start a book, then pick up another one and another one. This usually happens with books that are hard for me to get in to. If I love a book, I find it really hard to put it down at all. In fact, I will continue reading it until the weeeeeeeee hours of the night and completely ruin myself for the next day!